Rihanna took to Instagram on Wednesday night to promote her Fenty Beauty line, continuing the trend of the singer-turned beauty-and-fashion-genius as her own biggest advocate. And, if it's good enough for RiRi, it's certainly good enough for us! Achieving that post-summer natural glow with an unexpected pop, Rihanna is showing us that we can get just that with the help of her Gloss Bomb Universal Lip Luminizer. The brand calls the product "addictive shine," and it's clear why. 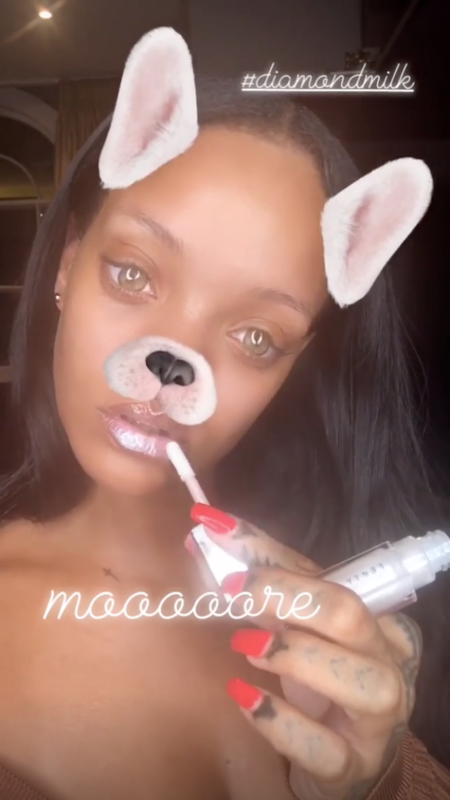 In Rihanna's vid, she puts on and removes the metallic lip treatment on a loop, writing on the image "#DiamondMilk," as that's the name of the "Diamond" singer's newest Gloss Bomb shade. The release was announced just a few days ago on the brand's website, as they shared, "The lipgloss that made you fall in love, in a brand new shade!" adding that it's "a shimmery wash of pearl that's like a dewy highlight for your lips! And you KNOW it has the same, ultra nourishing feel of our original gloss bomb, just now in a whole new milky pearl shade." While you can shop the original selection now, Rihanna's teaser tone won't hit shelves until tomorrow, September 7.